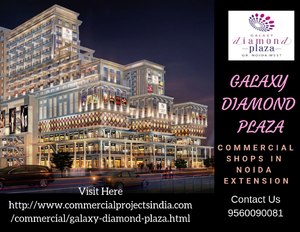 Galaxy group offers retail shops, commercial space in Galaxy Diamond Plaza in Noida Extension. Galaxy Diamond Plaza commercial project is speared in the land area of 2.5 acres. This commercial property is designed uniquely with facilities like multiple parking, multiplexes, centralized AC retail outlets, well metro connectivity,& 24 hr security surveillance. Call today to book 9560090081.